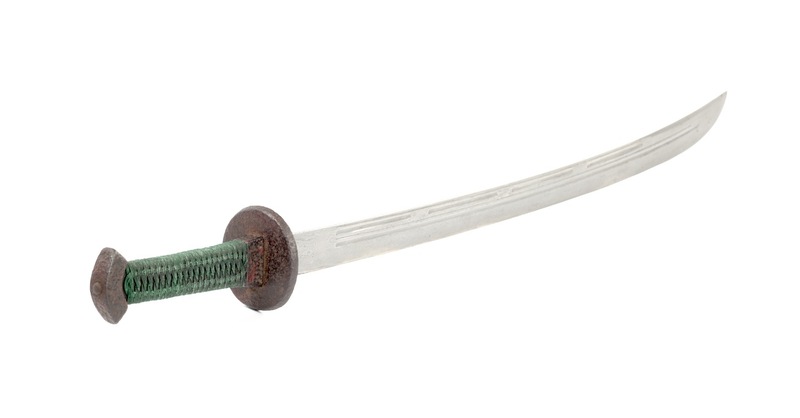 The yaodao , literally "waist saber" was the standard side-arm for the Qing dynasty military. Those of the soldiers of the Green Standard Army were produced by the state under the Board of Works. Officers and soldiers of the elite Eight Banners got paid in silver and were required to commission their own sabers from arms smiths. 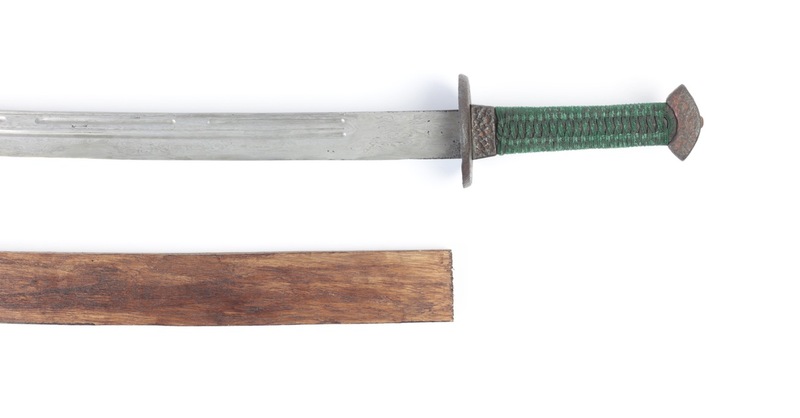 There were strict regulations for materials used -brass fittings for soldiers, iron fittings for officers- but blade style was not so strictly regulated. 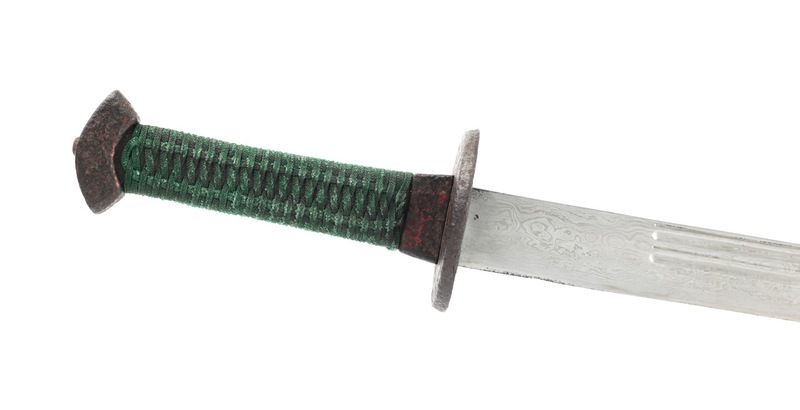 As a result, there is an incredible variety of Chinese officer saber blades. Dating: Early to mid 18th century. 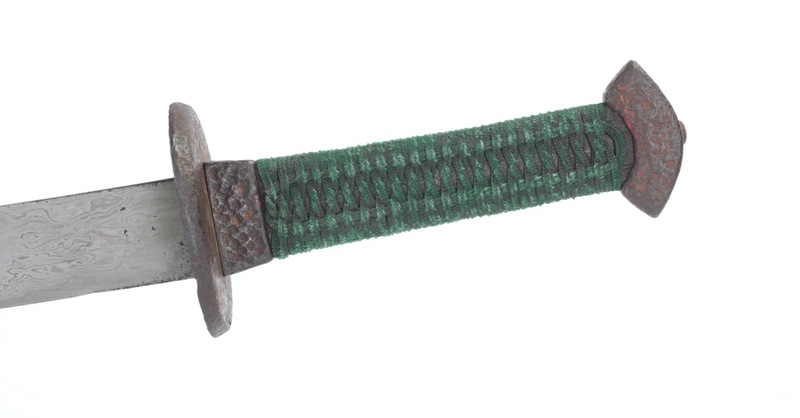 A Chinese officer's saber of the 18th century. 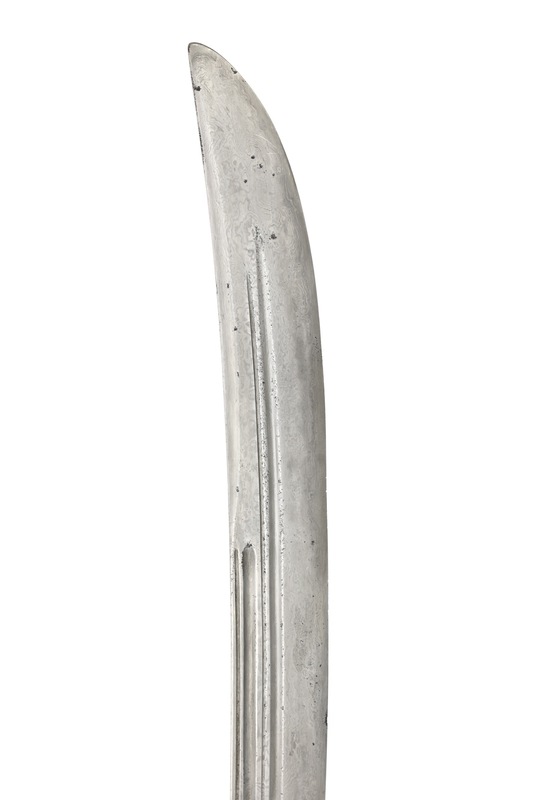 Sabers from this period are of a higher quality and often exhibit more artistic merit than those of the next century, and are therefore highly sought-after by collectors. 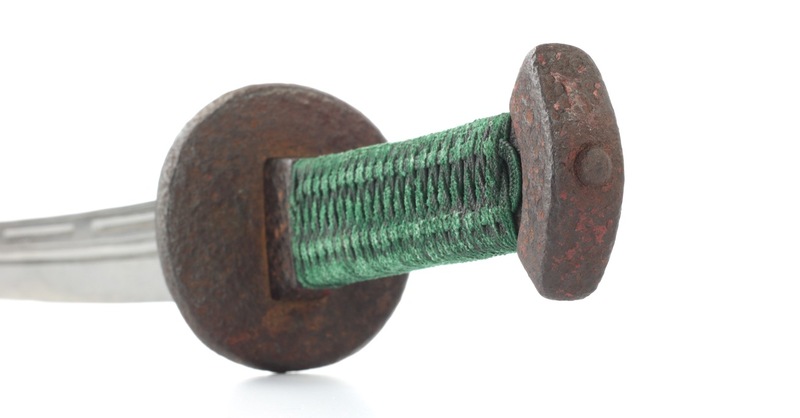 It is getting increasingly hard to find examples of good quality and condition. 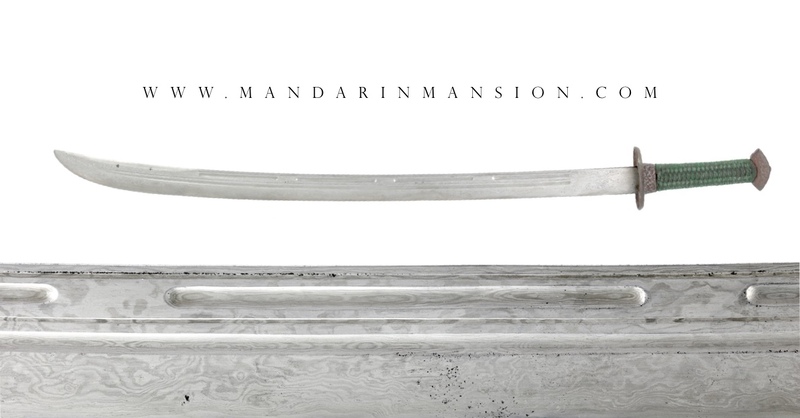 It is built around a very fine blade, of liuyedao form with a gentle curvature. 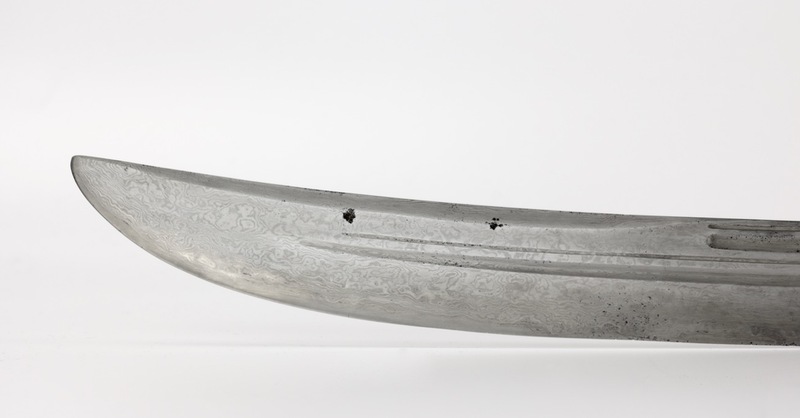 The blade is in recent polish to reveal its forge folded construction with inserted high-carbon plate exposed at the edges. 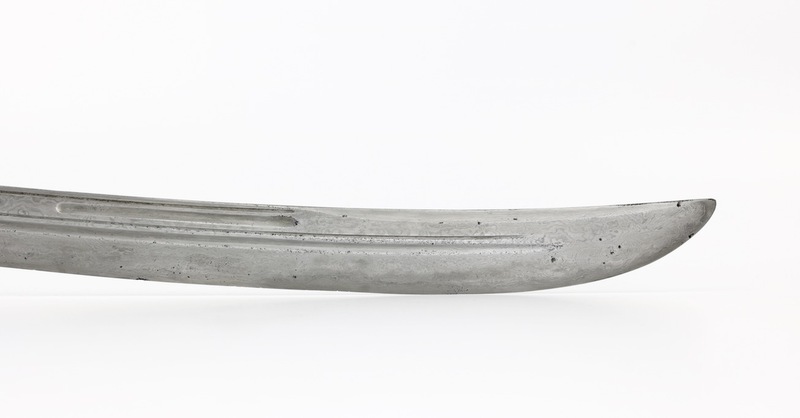 The body of the sword is forged into an exceptionally lively pattern of "damascus" steel. 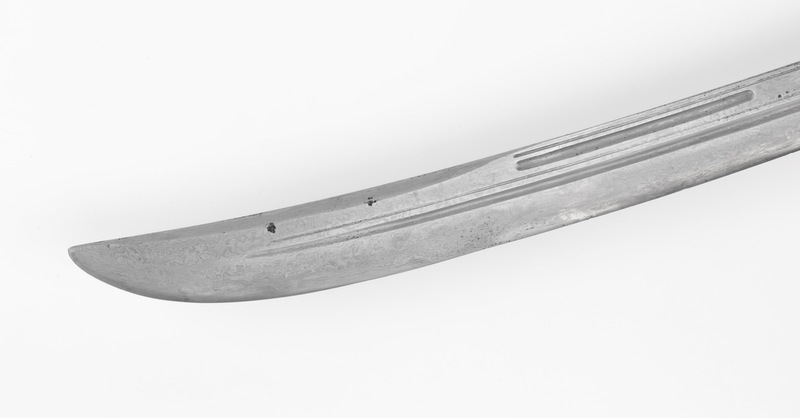 The blade of interesting geometry: a narrow groove runs along the spine of the blade, under that a groove in four segments, both terminate right before a false backedge. Under these a pair of continuous grooves, narrow on top, wide on the bottom, that run all the way to terminate in a gentle upward sweep near the tip. All grooves and bevels crafted with considerable care, exhibiting an almost industrial looking precision. 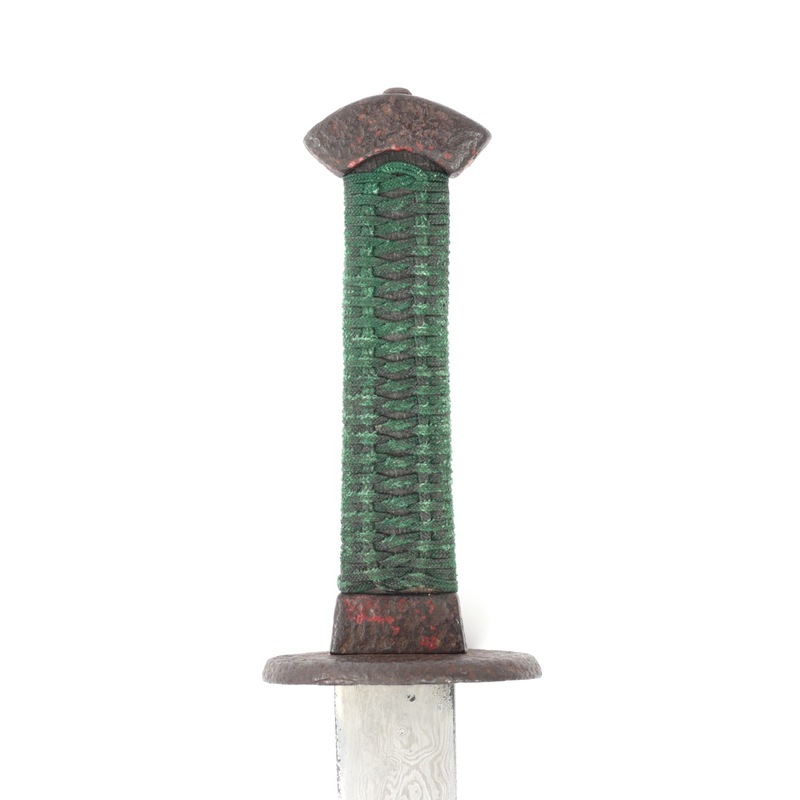 Edge contours are still intact, no signs of excessive grinding that are so common on Chinese swords of this age. 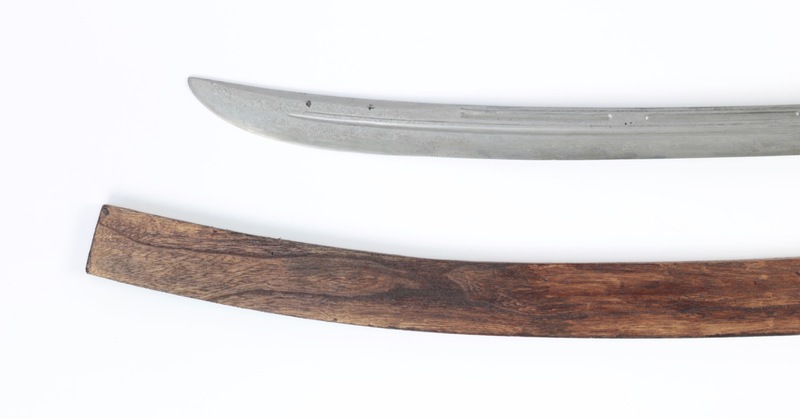 It comes mounted in classic iron fangshi fittings that are original to the piece; the original peening at the pommel still intact. 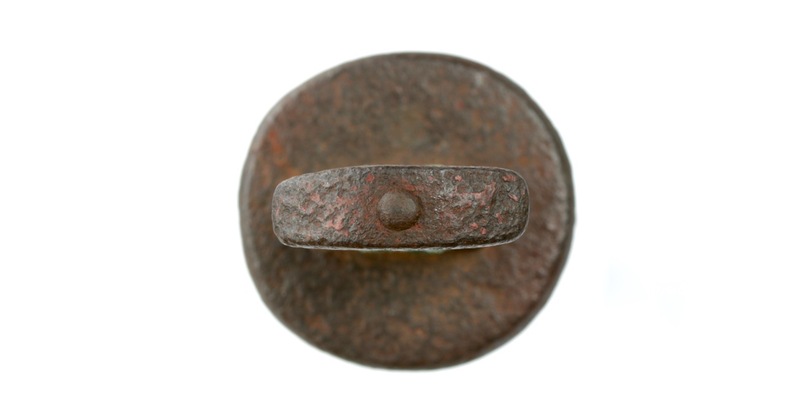 There are remains of red pigment on the fittings. 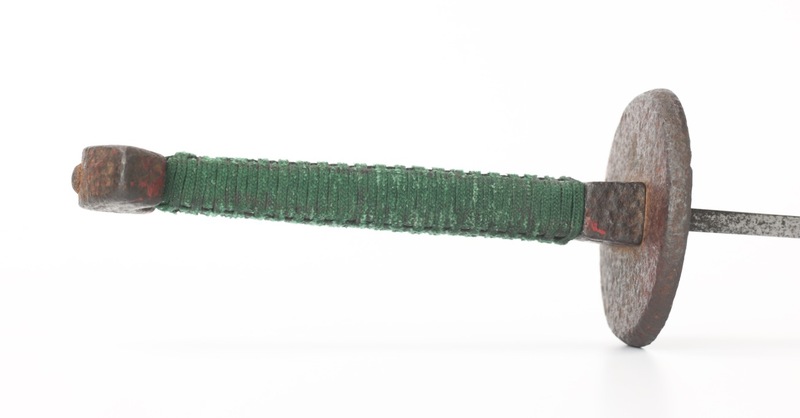 This was probably done later in its working life because some of the pigment is in the bottom of the pits in the fittings, indicating the handle aged a lot already before the pigment was applied. (Some of these sabers remained in use over generations, young soldiers inheriting them or buying them from retired Bannermen.) Handle is tight, no movement whatsoever. The grip wrap is new, done by me with my best genuine silk cord. I artificially aged it to match the fittings. 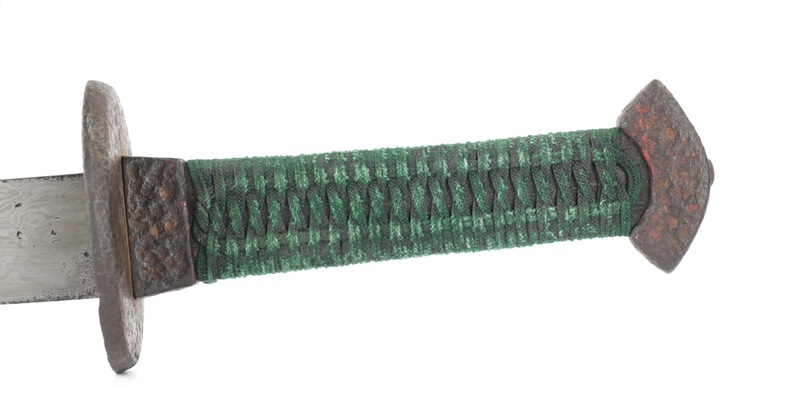 Is sold with a rudimentary resting scabbard. 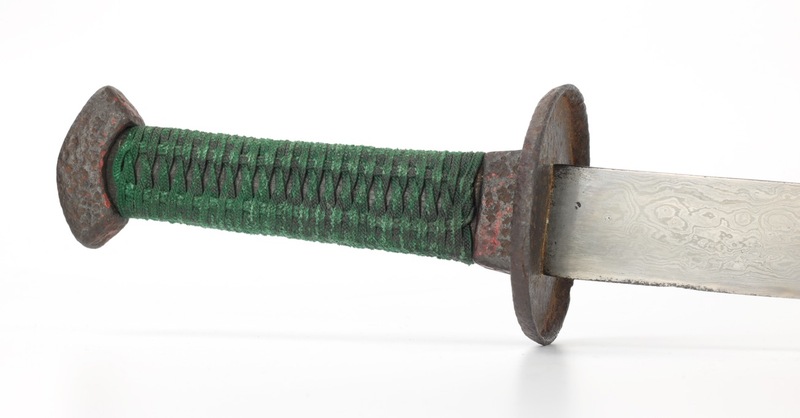 A nice example of a Chinese officer's saber of the 18th century, with high-quality pattern welded blade exhibiting a very active pattern. It has an interesting configuration of grooves and bevels.